The most fun a youth ball player will EVER have playing the game is when they understand the fundamentals of the game! Impact coaches pride themselves on teaching fundamental baseballs skills in through uniquely fun and engaging drills that kids absolutely love. As kids learn the skills and get reps (without knowing they are working hard! ), they see improvement, creating a cycle of confidence building and further hard work! Our Staff is comprised of former professional and collegiate players who believe in fueling this cycle to help kids be their absolute best! We can't wait to meet your athlete! Impact began as a series of clinics and, as popularity grew, we began offering camps, more intensive clinics, and lessons. People responded well, and Impact kept growing and evolving to meet the community's needs. 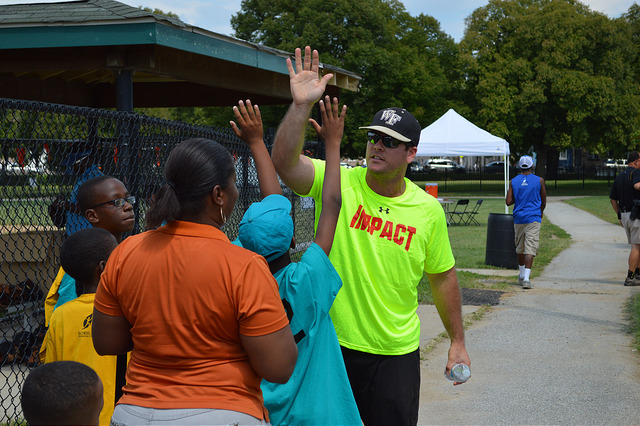 In the years since Impact's creation, we have offered hundreds of camps and clinics and provided thousands hours of lessons in the great Baltimore area. Most notably, Impact has hosted camps with Manny Machado, MLB’s Playball with commissioner Rob Manfred and hall of fame Frankie Robinson, and has partnered with local little leagues like RPBL, Towsontowne, LTRC, TRC little league, Cockeysville, Wellwood, and Baltimore Parks and Recreation.